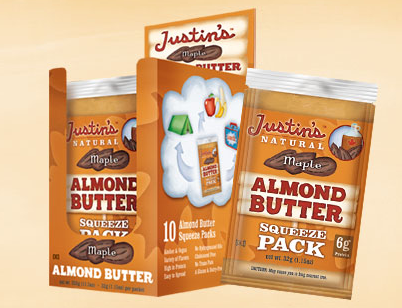 I received a jar of Justin’s Maple Almond Butter along with a few small packages of various flavours of almond butter and peanut butter. I immediately cracked the jar open and had a big scoop with an apple. This almond butter is one of the best I have ever had. You’d think with the maple it might be too sweet like I find the PB&Co. Mighty Maple Peanut Butter but it was a perfect balance of sweet and nutty. I have now had it on apples, toast and a big scoop on a spoon and it sure is good I’m looking forward to trying the other flavour samples that I received – but I am saving them for our cruise so I have a little stash of yummy nut butter to have instead of the sweet sugary preservative filled peanut butter I imagine will be on the cruise. Yum! I love the mighty maple PB but I bet the maple flavor goes really great with almond butter too. I’ve seen this on other folks’ blogs, but my Whole Foods doesn’t carry it. Boo. You should request that they carry it! I was given a few samples of these and they are delicious. How did you get samples Twoveganboys?? Tan-nee if you e-mail the company and request samples they might send you some! If not let me know and I will send you some!